Take some time to appreciate the natural world around you this Valentine’s Day with our 5 nature-inspired craft suggestions. They are simple, easy, and lots of fun for all ages! So, find your favorite Valentines and get creative. First of all, what is land art? Land art is art that is made directly in the landscape, sculpting the land itself into earthworks or making structures in the landscape using natural materials such as rocks or twigs. To make land art hearts with your kids, gather leaves, twigs, flower petals, rocks, pinecones - whatever you can find outside - and shape them into a heart (or two or three). Leave them for others to find and enjoy! 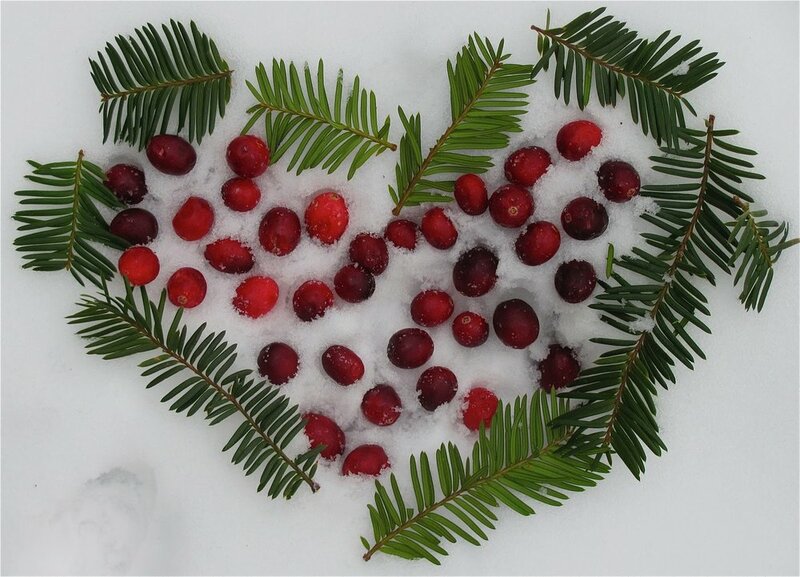 Check out this beautiful evergreen and cranberry land art heart from the Chocolate Muffin Tree. Ice hearts are another super simple craft to do with kids. All you need is a heart mold and food coloring. Fill the mold with water and a little bit of food coloring and then place the mold in the freezer (or outside if it’s cold enough). Wait until the water freezes and then use a little bit of warm water to pop the hearts out of the mold. Voilà! Beautiful ice hearts! You can use them to make an ice heart garden in the snow or in a special Valentine’s Day drink (pink lemonade with ice hearts, anyone?). Yes, this is exactly what it sounds like and oh-so-much fun! Hunt for rocks with a flat surface that will be easy to paint. Then grab a paintbrush and some acrylic paint in Valentine’s Day colors of your choice, and let your child go to town! A super simple, yet eye-popping design - have your child paint a heart on the rock and then outline it with a black sharpie pen. It will look amazing and your child now has a gift to give to his or her Valentine. This is a great idea in lieu of the traditional Valentine’s day card or candy. And if you use burlap like Design Mom suggests, they can be planted directly in the ground in the spring. You will need organic potting soil, gardening string or twine, seeds, and scissors. You will also need burlap. You can buy burlap by the yard and cut out squares yourself or you can buy small, all natural burlap bags like these found on Amazon. Okay, I have 3 kids and I work full-time, so I prefer crafts that are super easy to do. I wouldn’t classify this one as “easy” or “simple,” but it’s pretty cool and the directions are clear. Also, it doesn’t require a lot of supplies. Read more about this DIY Heart-Shaped Bird Feeder at Alpha Mom. If you do need something easier, check out this DIY Bird Feeder from Kids Craft Room that is also heart-shaped. Once all the cereal is gone, you can refill it all year long!